Occupying the midpoint of our 7x19mm stainless steel wire rope range in terms of diameter, this 8mm 7×19 Stainless Steel Wire Rope product has a hefty load capacity and a construction that allows it to be much more flexible than you might think. The 3,709kg working load limit of this particular stainless steel rope allows it to take on lifting tasks where necessary. However, the 36.4kN breaking force may be more relevant if you are planning to use it as a control cable within a larger assembly. The fact that this wire rope will not rust in moist environments makes it well worth choosing if your business operates within the maritime or water treatment industries. It is also generally a good choice if you are looking for rope that will survive outside, where rain can lash it for years on end without causing corrosion. 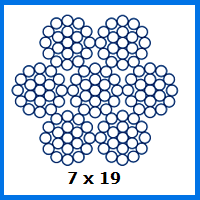 7×19 wire rope will beat its counterparts in the flexibility stakes, even if a 1×19 construction rope with the same 8mm thickness will be stronger. We make all sorts of lifting slings using this 7×19 rope and it can even be turned into a custom assembly using the various fittings we stock. The variety of options you encounter by shopping with Rope Services Direct is therefore very hard to beat. Start enjoying your stainless steel rope sooner by placing an order with us. Call 01384 78004 or use our site to get in touch with our expert sales staff. 8mm 7x19 Stainless Steel Wire Rope Overall rating: 5 out of 5 based on 6 reviews.